Mount Sinai Hospital is an extremely busy hospital located near Central Park in New York City. The problem is, when you Google it, Google Maps is listing the wrong phone number. 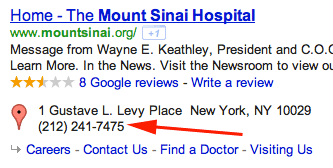 Google is listing (212) 241-7475 instead of (212) 241-6500. The 7475 number goes to a specific office within the hospital, the 6500 number goes to the main switch board which is capable of handling the volume of calls necessary for a hospital of that size. In individual responsible for the listing said this is a huge concern because "there are hundred of calls going to the wrong department." The team's working to fix this, please just don't touch anything right now (in MM, etc.). Normally these are not huge concerns but when it comes to emergency care and alerts, it makes a huge difference. This is not the first time Google ran into an issue with sending people to the wrong hospital and I bet it won't be the last.